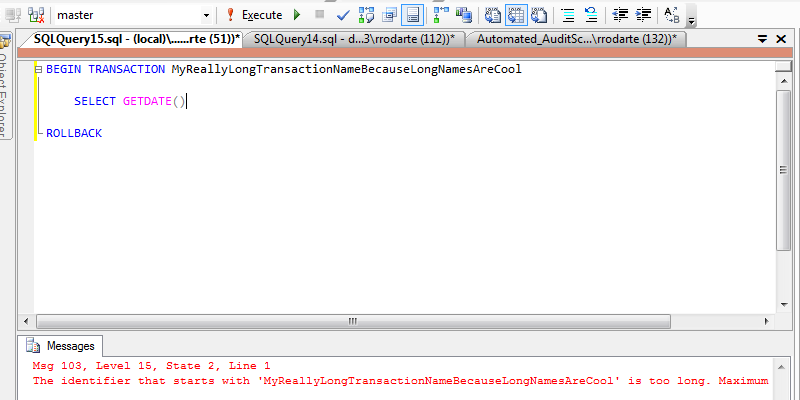 The identifier that starts with 'MyReallyLongTransactionNameBecauseLongNamesAreCool' is too long. Maximum length is 32. Not cool, especially if you’re using dynamic SQL to create automated scripts. In this case, simply change the transaction identifier to something a little smaller, but just as descriptive. Previous Previous post: Rudy: An MCITP Today. Rudy: An MCM Tomorrow?